Includes Labria, Nabrun Leids and Takeel. Their remote location makes the spaceports of Tatooine havens for many suspicious travelers from across the galaxy. At the Mos Eisley spaceport, Chalmun's Ca. . .
On the run from Imperial stormtroopers, Jedi Knight Obi-Wan Kenobi and Luke Skywalker enter the seedy Mos Eisley Cantina in hopes of finding swift passage to the planet Alderaan. Inside, among the gal. . . The Rebel Alliance has infiltrated the Galactic Empire's most powerful battle station, the Death Star! posing as stormtroopers escorting a prisoner, Han Solo, Luke Skywalker and Chewbacca attempt a da. . . Under the evil gaze of Emperor Palpatine, the lightsabers of two Jedi Knights - a father and son - clash furiously in a final duel between the light side and dark side of the Force. Slowly, the young . . . Deep within the dimly lit halls of Jabba the Hutt's palace on Tatooine, the musical combo, the Max Rebo Band, entertains some of the galaxy's most notorious smugglers, mercenaries, and bounty hunters.. . .
Includes Klaatu, Barada and Nikto. Jabba the Hutt always enjoyed the thrill of using the lives of others as tokens in his games of peril and doom. Years ago he presided over the dangerous Tatooine Po. . .
Obi-Wan Kenobi, Anakin Skywalker, and Yoda -- three individuals with lives intricately intertwined. Before Obi-Wan Kenobi was forced into a life of hiding, before Anakin Skywalker gave in to the dark . . . Fleeing the fierce Imperial assault on the frozen planet Hoth, the Millennium Falcon and the Rebel crew fly into the midst of a waiting Imperial war fleet. Unable to engage the Falcon's malfunctioning. . . Under attack by an Imperial Star Destroyer, protocol droid C-3PO and his partner R2-D2 safely escaped a battered Rebel capital ship and landed on the desert planet of Tatooine. Soon after, the droids . 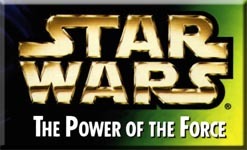 . .
Includes Ten Numb, Wedge Antilles and Arvel Crynyd For generations, an evil power has spread throughout the galaxy. It began with Darth Sidious' sinister plot to conquer the planet Naboo and peaked w. . .